Fun Ideas for Reducing Cortisol Levels: Pick Your Favorite Stress Management Activity and Offset the FAT Triggers for Good! You learn practical methods for reducing cortisol levels and chronic stress as part of any holistic, mind-body approach to easy and effective weight loss. Because – if you are like most people – when you’re experiencing long-term stress relaxation techniques don’t come to mind readily, I’m giving you here some quick ideas that you can apply immediately. Just pick your favorite stress management activity from the practical stress relaxation techniques below. If you need a refresher, let’s remember that the main cause of chronic high cortisol levels is long-term physical and/or psychological (emotional) stress. Beyond the obvious fat gain in the abdominal area, you’ll probably experience additional (sometimes silent) high cortisol symptoms. Because most of the times, when you are stressed out for a long time, you won’t even feel it; rather, you’ll notice its disturbing effects of stress on your health. …food cravings, brain fog, irritability, being impatient, inability to make decisions, high anxiety, always feeling that something needs to be done, body tension, chest pains, shallow breathing, upset stomach, increased pulse or heart pounding? These are just a few on the long list of high cortisol symptoms. This is when you must take specific actions to lower the levels of cortisol (the fat-storing hormone) in your body. Here are two stress relaxation techniques that you can do anytime, anywhere, for as little as 5-10 minutes. Brisk walking, mild aerobic exercising, or any form of moderate-to-intense physical activity is the easiest, most convenient way to neutralize the stress hormones and restore your calm – as long as you work up a sweat. No, you don’t need to go to the gym and work out for an hour to lower your cortisol levels and turn off your body’s fat-storing switch! 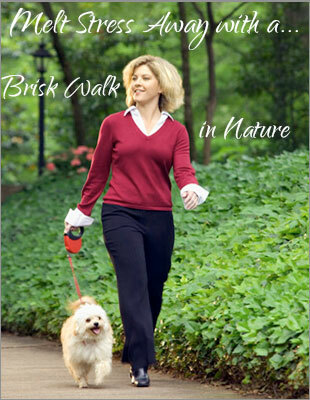 Even a 5-10 min brisk walk in a park or around the block, jumping up and down or 30 sit-ups in your office will do. Or, you can climb a few flights of stairs at work, clean up a room in your house or mow your lawn. The more vigorous the activity, the more effective it is at reducing your cortisol levels and increasing your natural endorphins (the”feel-good” hormones). Deep breathing (or diaphragmatic breathing) is the quickest, most effective stress management activity you can use. No, it’s not only for yoga practitioners; you can easily learn and practice this amazingly simple technique to quickly eliminate stress and lower cortisol levels in your body, whether you’re in your backyard at home, in the office at work or even in your car in the middle of a traffic jam or at a stop light. Here’s the A-B-C of how to do it in three simple steps. A. Sit straight and place one of your hands on your abdomen, then exhale completely to empty your lungs. B. Inhale deeply and slowly through your nose, expanding your diaphragm (belly) to bring in the air into the lower parts of your lungs first, then gradually fill them from bottom to the top, expanding your chest and lifting your shoulders for extra volume. C. Keep the air in for as long as it’s comfortable, then exhale slowly through your mouth while relaxing your shoulders and chest, until you’ve completely emptied your lungs. Repeat this rhythmic, calming breathing 5 or 6 times and see your worries and stress simply dissolving in a matter of minutes, dramatically reducing cortisol levels in your body and turning off the fat-storing switch. The benefits of using these ideas and applying the tips for reducing cortisol levels? Well, you become able to deflect constructively chronic stress rather than over-react, lose sleep, overeat and even become totally unproductive; you get to avoid the grim health consequences of chronic stress. As a result, your body becomes able to burn fat rather than store it. Would you like to get rid once and for all of the nasty consequences of high cortisol levels on your body weight (and of all the other symptoms of chronic stress)?